There are a lot of comics out there coming in a lot of different forms. That’s one of the coolest things about today’s industry – cool comics can come from a lot of places and from all kinds of people. 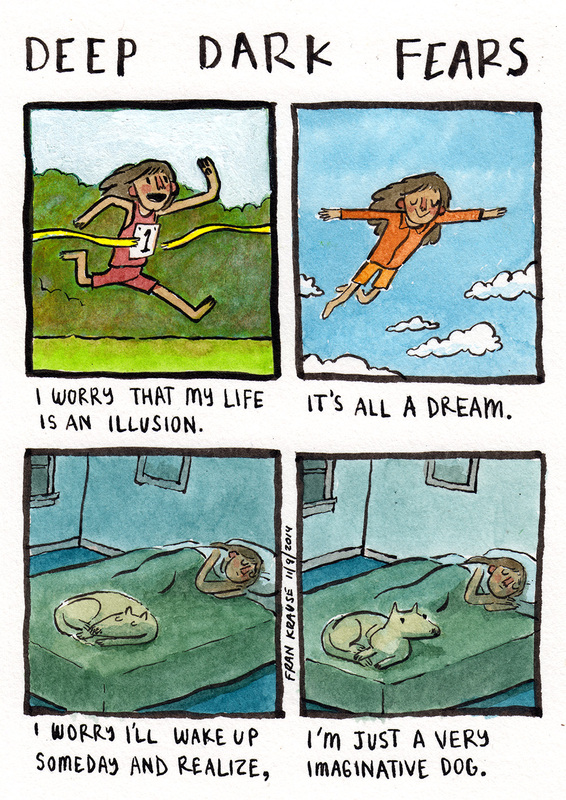 That leads to unexpected projects like Fran Krause’s excellent Deep Dark Fears webcomic. The basic premise is this: Krause started a Tumblr in which he brought his irrational fears to life in comic form. Everyone has their own fears – some more than others – and once Krause got that ball rolling, readers started contributing their own for Krause to turn into comics once a week. What it resulted in is a creepy, surprisingly funny and strangely relatable series of comics that are still coming, but can now be read in a beautiful print collection from Ten Speed Press. It’s a really great read, and I reached out to Krause to talk about the genesis of the project, what his background is, how he came into comics (he works in animation by day), what working with Ten Speed Press was like, and much more. Take a look at our chat below, and if the project sounds of interest to you, at least sample it on Tumblr. It’s a superb project. Let’s start with your background. What’s your artistic education? Did you go to school for art or are you self-taught? FK: I had art classes in grade school and high school, but when I was fifteen or so I started taking night classes at a local art college in Utica, NY called Munson Williams Proctor Institute. I went to the Rhode Island School of Design for animation, and recently got an MFA from Goddard College in Vermont. I know you work in animation, but I’m curious as to your background in comics. What drove your interest in creating your own comics? Have you been doing that for a long time as a hobby? FK: I’m very new to comics. I worked with James Kochalka on some animated cartoons based on his work, and I was impressed (and jealous) that he could tell a full story in only a few drawings. It felt very immediate and direct, compared to animation. I also was impressed with Tumblr – many of my students had been using it to showcase their work, and it seemed like a fun, positive space for making things. 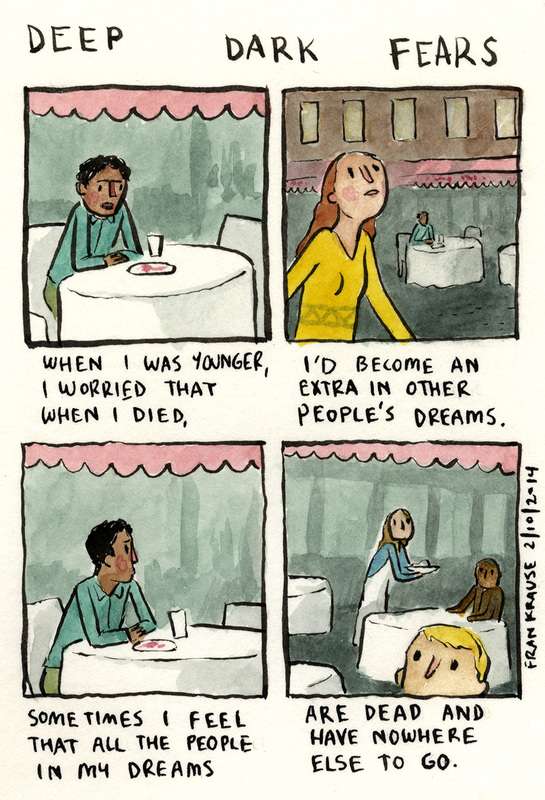 I really, really enjoyed Deep Dark Fears. It’s a fantastic and relate-able read, even in some of the odder fears. How did the idea for the project develop and what made you feel it was a great fit for sequential storytelling? FK: Well, when James and I wrapped up his animated series and put it on YouTube, it was the first time I had really made something for YouTube, and the comments were a real eye-opener. The experience made me want to make work for a space that was more positive. Around that time, I had an account on Tumblr that I didn’t really use for anything, but I posted an animated GIF I’d made, and one weekend it wound up on Tumblr Radar and I had 1,000 followers. I didn’t really have an online presence before that, but I thought it would be nice to have something to share with my new followers. Working with James, I knew I wanted to try a comic series, and I’ve always had a lot of irrational fears, so one day I made a list of about thirty and thought, “This is something that could turn into a weekly series.” I think it fits as a comic because comics leave a lot to their reader’s imaginations. With an animation, we tell almost everything – movement, timing, sound, etc. With a comic, the reader has to imagine all these things. For this subject, it’s good to be inside my reader’s heads in that way. The crowd-sourced nature of the fear makes sense as a way to generate more fears. How did that part come together, and were you excited that so many people were willing to be a part of the team in their own way? FK: That’s been a really magical element of the comic for me. The comic started as a list of my fears. 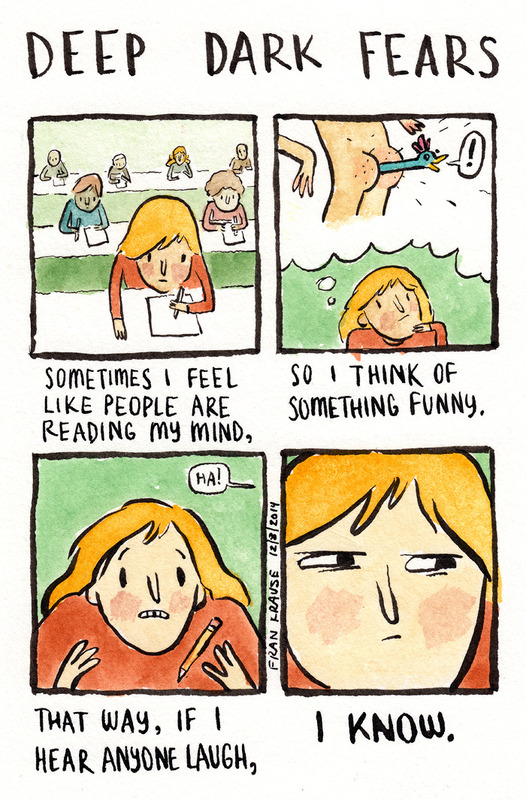 After I’d drawn about twenty or thirty, people just started sending in their fears. I think they may have seen all mine and not realized that they were all from one person. Once I started posting comics and mentioning they were drawn from submissions, people really started sending their own. My readers have been very generous. If it’s possible to choose a favorite fear, mine was Fear #22: the kid who is afraid people can read his mind. It’s not that this one was particularly relatable, I just really loved the way you explained this fear. The timing of the fourth panel with the deep zoom into the kid’s face and the “I Know” underneath it actually made me laugh out loud and then show it off to my wife afterwards. I’m curious, what was your process for laying these out? Did you plot out the structure of each of them before drawing or was it more improvisational? FK: Thanks! That one is a favorite of mine too. Well, the main goal of most art-making is to find the fun – there should be playing and exploring. I usually draw the grid, then put together the text. The text really forms the skeleton for me. I think the images can follow the text much more easily than the other way around. When I got the book, I was at work. A coworker saw it on my desk and we ended up going over quite a few of them together, and we were both blown away by how relatable even the oddest ones were (and the weird ones we shared). Were you surprised by how both universal and relatable the fears ended up being? FK: At first, I was. I was sharing my fears as sort of a “Look at how weird these are!” experiment. I wasn’t embarrassed, I thought they were interesting fears – but I didn’t think people were going to relate to them. After I started the comic, though, it’s really been an odd conversational ice-breaker. Everyone has irrational fears, and they usually feel better after sharing them. Another aspect I found to be fascinating while reading it was how it was the first time I realized there were some fears that weren’t just me. Like, when I was a kid I made deals with the evil things in my basement that if I made it out of the dark in ten seconds, I was cool. I thought it was odd until I read the comic, and someone else had that! It was rad. Did you hear that a lot? What do you think it is about fears that have such a communal feeling to them? FK: I’m not sure about this one. They seem obscure and personal. Someone had sent this one to me, but when I read it I remembered that I’d had the same deal with whatever was living in my basement as a kid. I think kids have excellent imaginations. There’s a lot they don’t know, so they make up stories. Their imaginations get a lot of exercise. There’s probably tons of stories we told ourselves as kids that we’re not even remembering right now. I think the really wonderful thing about kid logic is that they think logic can be used in illogical situations. For instance, when bargaining with ghosts. Why not? When they ask an adult for an explanation, they always get a logical explanation. Kids try to make their own logical framework for the world, but it’s chock full of imaginary elements. Isn’t that great? The book was published by Ten Speed Press, and I have to say, it’s a lovely production. The cover is really wonderful, and everything is super high quality. How was the experience of working with that team, and what made them a great fit for taking the book to print? FK: I worked with Kaitlin Ketchum and Betsy Stromberg, and they were wonderful. They really understood what I wanted out of the book, and they helped me make it the book I wanted. At some point, the book was around 120 pages, and we thought it looked too crowded. I wanted to add some blank pages to give it a little breathing room, but I didn’t want to remove any comics. They figured out how I could get another 24 pages without using cheaper paper or raising the cover price. They were also very good about letting me try some quirky designs. I wanted it to look like an old book you might find in an attic – but I figured that a publisher would want a bright, colorful cover and not a black cover with a ramshackle house. They really let me make my own book.